Momentum investing is based on the idea that tomorrow’s winners and losers will resemble yesterday’s winners and losers on average, whether on 12-month total return, or 3-month earnings revision bases. We find that macro factors can predict when momentum factors are likely to work well, although there are also micro explanations for why the behavioural bias exists too. Sometimes we just need to acknowledge that the market knows better. Many people, including ourselves, are uncomfortable with momentum investing, because it is a trend following strategy, and seems so consensus. How is it possible that one could be “counter consensus” in backing momentum? Some style rotation frameworks are worth highlighting to answer this question. 1. 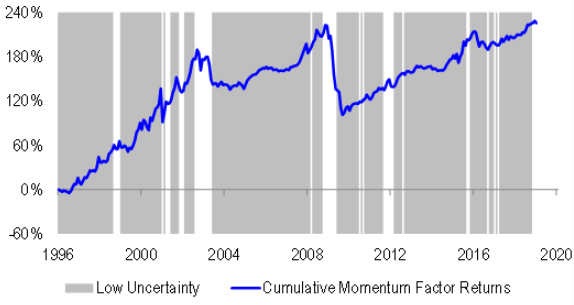 When we are slowing out of an expansion phase, uncertainty is usually the best way to time the factor, because high uncertainty goes hand in hand with wider credit spreads and de-leveraging. De-leveraging forces wrong foot pro-cyclically positioned investors, who typically wait until the final moments of the cycle before unwinding their positions. 2. When the economy is in the doldrums but on the cusp of recovery, the real yield curve (the spread between real 10-year bond yields and real short-term interest rates) is the better way to time the factor. 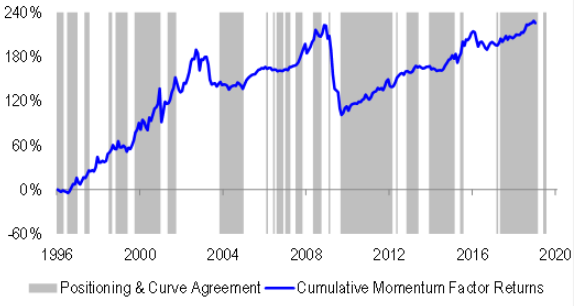 When momentum has favoured defensives over cyclicals, and the yield curve has steepened to have a positive slope, the bond market signals green shoots of recovery, wrong footing excessively pessimistic investors. We focus on the slope of the real yield curve, because it is the best way to gauge the appropriateness of policy settings, and the effectiveness of easing efforts. 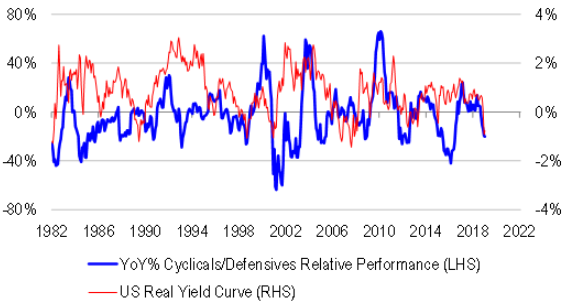 Over the past year, momentum has clearly favoured defensives over cyclicals, putting us into the second regime. But despite a miniature equity market recovery, and some soothing words from central bankers, the slope of the real yield curve remains firmly negative. In other words, we are not getting the bond market’s confirmation that recovery is in short order. 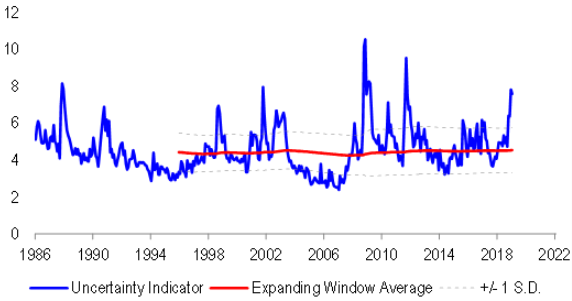 Therefore, defensive momentum is likely to persist for a while longer. 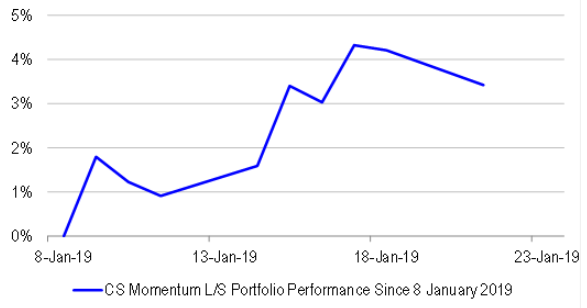 Intuitively, we think that momentum is picking safehaven exposures within the equity market better than traditional quality metrics (such as safety, profitability, payout and growth). From our earlier note “The Hunt for Red October” dated 19th October 2018, we argued that investors are questioning the safety value of defensive or high quality US equities. They are now revisiting conventional safehavens such as bonds and selected commodities, without completely giving up on high quality stocks. By nature, the evolving search for safety is hard to capture with traditional quality metrics – but we need to be prepared to listen to what the market is telling us about the search. Within the Australian market, momentum is clearly favouring bond proxies (eg A-REITs), some high quality industrials (eg healthcare), and selected resources names (eg gold and diversifieds). On the short side, momentum is picking domestic cyclicals and banks. We think that this too is appropriate. There is plenty of room for the building cycle to undershoot, given excessive building over the past few years. There is plenty of room for the household saving rate to rise in response to falling asset prices and tightening lending standards. And there is still some room for credit growth to slow in response to tighter financial conditions. So while we are seeing softer (weaker) data now, there is reason to believe that the slowdown, and the downgrade cycle will continue. 1. 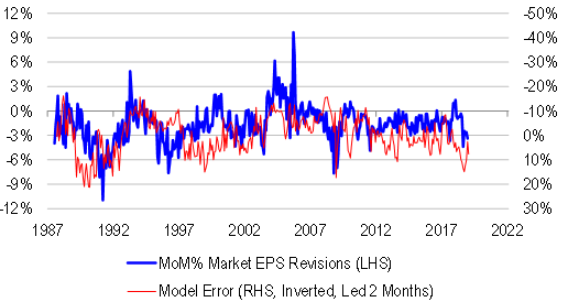 We demonstrate that earnings revisions are going to matter more now, than in the past, because momentum-based strategies should be working very well. 2. We identify where the earnings downgrades are likely to come from, and why they are likely to continue in the domestic space. On the flipside, we are also arguing that deep value, and value traps are likely to persist for a while longer. 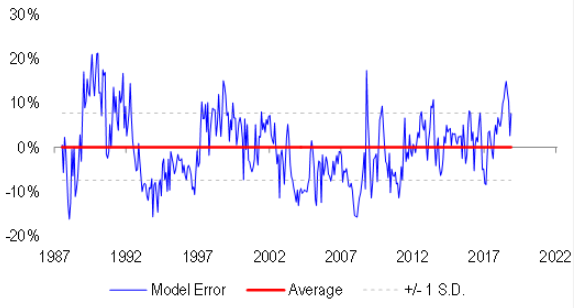 Mean reversion is a difficult feat, when there is no anchor for the system to revolve around. 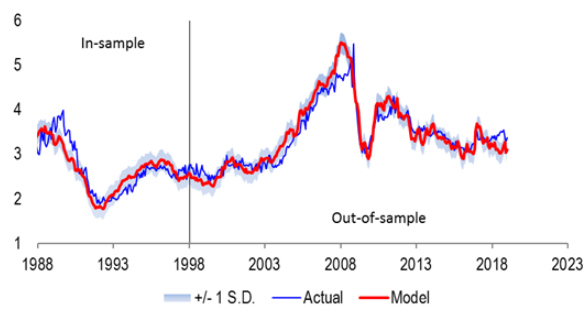 Also, in our earlier article “A market earnings model for Australia”, we developed a macro framework for predicting market earnings based on credit growth, commodity prices and currency. Updating this work, we find that market earnings are overshooting fundamentals by more than 8%, implying that overall downgrades are likely to be material. We persist with the model portfolio from our contribution to the “Asia Pacific Equity Strategy: 2019 Outlook”. Top 5 longs include: CSL, RMD, A2M, BHP and GMG. Top 5 shorts include: JBH, BLD, WBC, NAB and SGR. This portfolio marries up stock momentum with Credit Suisse analyst recommendations. Since inception, it has delivered 342bps worth of alpha.